Imagine grabbing brunch with your girls. Giggling over mimosas, catching up on the love life situation (or lack thereof...sigh), getting the scoop on the latest shopping deals and...whether you should pull your money out of your 401k plan to invest elsewhere. Although money may not seem like a topic you wish to broach on a day out with the girls, the fact is that women are not paying enough attention to their financial health. “Along with wage inequality, women retire with just two-thirds the money men have, all while living at least 5 years longer than men,” states Sallie Krawcheck, a Wall Street powerhouse and the founder of ElleVest, in an interview with CNBC. On average, less than 30% of people feel confident in their ability to absorb a financial shock according to the Prosper Financial Wellness Survey. Furthermore, Fidelity’s “Money FIT Women Study” shares that while 75% of women wish to learn more about finances, only 47% felt confident to bring up money topics on their own. The only way to become confident about money is to practice talking about it. Similar to any area of your life, practice makes progress. Think about the first time you gave a presentation or tried a new workout routine. It may have felt nerve-wracking or uncomfortable, but you got through it. After you got through the first time, each experience afterwards was much easier. The same goes with talking about money. The first few times you do it, it may feel uncomfortable. But, the more you do it, the easier it becomes. Especially if you practice with other women who will support you through it. And talking about money does not have to be boring. In fact, if women begin to associate finances with pleasurable activities- such as brunch or a girl’s night out- the fear around money will start to dissipate. Because obviously, any discussion over a mimosa is a fun discussion. So, go ahead and send out a text to three or five of your girlfriends, and invite them over to your home to grab some mimosas and follow these steps for your monthly money conversations. Month One- for the first get together, the intention is to have a conversation about how everyone approaches their finances and their vision of a dream lifestyle. You can even turn it into a vision board party where everyone cuts images out of old magazines that showcase their dream life. Question One: Do you create a budget for yourself? Or just wing it? Question Two: What’s your big vision for yourself? How will money help you achieve it? Month Two- the next gathering should be about about debt. Question One: How are you protecting yourself against identity theft? Have you checked out your credit report recently? Question Two: Do you give your kids an allowance? How do you teach them about money? Question Three: How much credit card and student loan debt do you have? Month Three- as you all become more comfortable chatting about money, expand the conversation to include more specific questions about finances. Question One: What does retirement mean to you? How are you preparing for it? Question Two: Do you work with a financial advisor? How often do you meet with her? What do you talk about? Question Three: What are your investments? Which industries do you focus on? What have your returns been? Question Four: What is your monthly income? Question Five: What are your monthly expenses and what do they each total? Question Six: How do you and your life partner split expenses? Question Seven: What’s something new that you learned about money recently? Question Eight: Is there anything that is currently stressing you about money? Continue to have these discussions on a monthly basis and watch your confidence around money soar. And now we'd love to hear from you! How often do you and your girlfriends get together to chat about money? And what do you talk about? Let us know in the comments below. 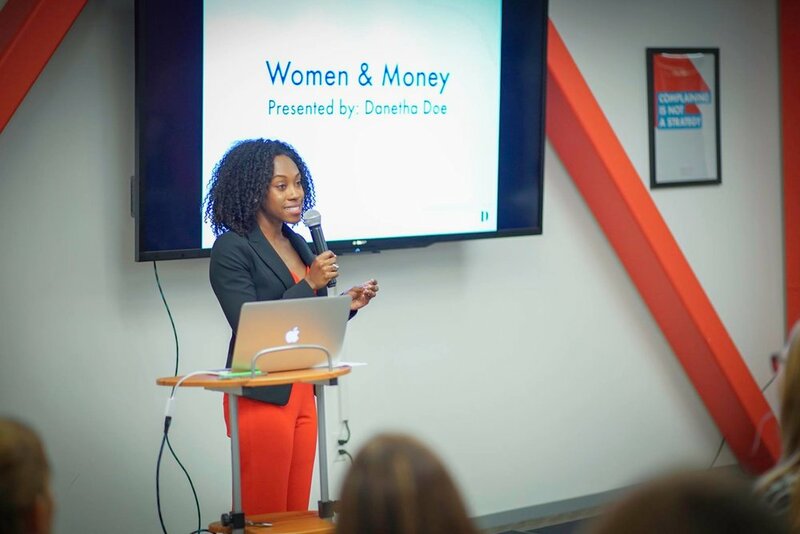 Money & Mimosas provides financial education trainings and community support to women entrepreneurs. Click here to join our newsletter. This post was in partnership with Prosper. This past week, I had the honor of leading my "Wealth and Wellness for the Independent Woman" workshop at Sensiba San Filippo, one of the fastest growing CPA firms in Silicon Valley. During these workshops, I share data to support why women's lack of confidence with money is the biggest reason why we have the gender wage gap and financial inequality. The key to boosting your confidence is to become aware, and improve, your emotional relationship with money. After walking through examples of how our family and cultural upbringing impacts our financial decisions, I facilitate a conversation where the group is encouraged to share personal experiences with money. The conversation this past week was particularly passionate and we all left inspired to become more aware of how our emotional relationship with money is impacting our financial health. Write down all the thoughts that come up when you hear the word "money". Take note of any words that have a negative connotation. Reflect on your earliest experiences with money. Was it hearing your parents argue about money? Was it your parents telling you "we can't afford this"? Or was it your parents being very hush about it and not talking about it with you? Take a moment to think about how this experience impacts your current approach to money. Who is your model for money? Usually this is a parent or guardian. Think about their habits with money and how you are repeating some of those habits. Similar to any area of your life that you hope to improve, the more awareness you have around why you have your current habits the easier it will be to change them. As you gain more clarity about your emotional relationship with money, your habits will begin to improve. Now we'd love to hear from you! What were some of your earliest experiences with money? Let us know in the comments below. For more tips on how to remove the emotional baggage you have with money, click here to join our weekly #MoneyandMimosas newsletter. Annoyed with how your partner spends money? Have a money date and clear the air.